NorCal Post And Frame Corp.
"Built with pride before the shamrock is applied"
Pre-engineered home. NorCal Post And Frame. Built by NorCal Post And Frame. Firestation building. The most diverse building. Pre-engineering made easy. Customer satisfaction is our number one priority. We provide professional building installation where quality is guaranteed. Contact us for a FREE building consultation! NorCal Post And Frame Corp. specializes in wide variety of pre-engineered buildings. Including pole buildings, metal buildings and storage buildings. Our buildings are professionally designed and expertly constructed to meet your specific needs and budget. 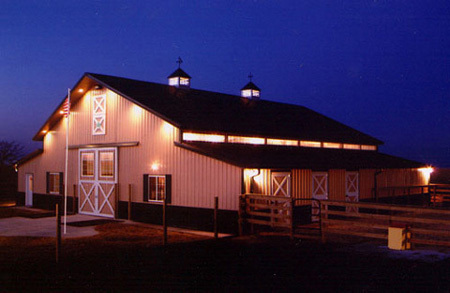 We provide a variety of pole buildings - Suburban buildings, Horse Barns & Arenas, Commercial and Residential buildings, Machine & Energy Miser Buildings, Livestock buildings, Mini-Storage buildings & more. We provide pole buildings for all of Oregon and California. Whatever your building needs...you'll find it here, like a weather-tight garage for your car or truck, a secure structure for boats & snowmobiles, a handy workshop, a country cottage, or any other need. The needs are unlimited. Choose from a wide variety of maintenance-free colors for your new building or structure. Stone, brick and wood sidings are also available. There's more! Dynamically plan your perfect commercial or residential building from the size of the building to the items that are in it. Try the Cleary Building Floor Planner now. Looking for more? Visit our frequently asked questions page for more answers to your burning questions. Additional service areas in California included but not limited to Yuba City, vacaville, Rancho Cordova, Red Bluff, Auburn, Chico, Stockton, Napa Valley, Lincoln, Marysville, & Sacramento. Fill out the form below to contact a sales representative via email. I used the quick contact form.